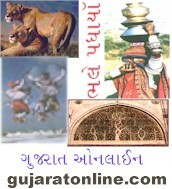 I was extremely excited when I visited Gujratonline. My sincere congratulations to the team who must have put a lot of efforts in making such a worldclass website. I was overjoyed to see the contents of the site. I wish you all the best in maintaining & upgrading this site. warm regards to you all. Vipul M. Bhatt, Mumbai, Maharashtra India. Would you like to say something too? Would you like your Gujarat/or India related site to be reviewed here?